The Kerala Backwaters are a chain of brackish lagoons and lakes lying parallel to the Arabian Sea coast of Kerala state in southern India. The network includes five large lakes (including Ashtamudi Kayal and Vembanad Kayal) linked by 1500 km of canals, both manmade and natural, fed by 38 rivers, and extending virtually half the length of Kerala state. The backwaters were formed by the action of waves and shore currents creating low barrier islands across the mouths of the many rivers flowing down from the Western Ghats range. Vembanad Lake is the largest lake in Kerala, India. It covers an area of 200 km�, and is bordered by Alappuzha, Kottayam, and Ernakulam districts. The lake lies at sea level, and is separated from the Arabian Sea by a narrow barrier island. Canals link the lake to coastal lakes to the north and south. Several rivers flow into the lake, including the Achenkovil, Manimala, Meenachil, Muvattupuzha, Pamba and Periyar. The lake surrounds the islands of Pathiramanal, Perumbalam and Pallippuram. The port of Kochi (Cochin) is located at the lake's outlet to the Arabian Sea. The town of Alapuzha, is sometimes called the "Venice of the East" for its large network of canals that meander through the town. The Vallam Kali (the Snake Boat Race) held every year in August is a major attraction. Vembanad Lake is designated a wetland of international importance under the Ramsar Convention. This is yet another important lake in the state of Kerala that exudes a soothing beauty. The Ashtamudhi Lake is so known because of its eight channels. The lake presents quiet an enchanting scene with the popular Chinese fishing net, Cheena Vala in the backdrop. It is considered the gateway to the Kollam backwaters as such tourists can hire a boat and sail into the quiet waters of the lake. The scene en route is almost hynotising. Situated 19 km from the Kollam town, the Sasthamkotta Lake is one of its kind in the state of Kerala. It is a freshwater lake spread over a huge area of 375 hectares. The highlight of this lake is that it neither gets frozen during the winter season nor does it dries up in the summers. Throughout the year, the freshwater of this lake provides clean drinking water for around 10 million people. For tourists, it is not just the scenic beauty and tranquility of the lake that is attractive, rather there is something else as well. An ancient Sastha temple stands on its shore which is major draw for pilgrims to Kerala. Quiet a little distance from Thiruvanantpuram is Akkulam Lake, a favoured picnic spot with a children's park. Lazing around in the park and boating in the cool waters of the lake is extremely popular with the tourists here. Situated at a distance of 3 km from south of Vythiri town and 13 km from Kalpetta, Pookot Lake is a primary attraction for anyone who sets his feet in the Wayanad region of Kerala. With huge mountains bordering it and tall trees providing a shade, the Pookot Lake presents a beauty that is pristine in every way. Boating on the calm waters of the Pookot Lake is also quiet an exciting option for tourists. Additional attractions include a freshwater aquarium with a number of colourful fish swimming in it, large variety of fish, a children's park and a shopping centre for handicrafts and spices. One of the important rivers in Kerala is the Periyar - the longest and the largest river in the state. The river is 244km long, and covers a drainage area of 5,398sq. km. Formed at a height of 1,853m, where a number of rivulets merge together in the Sivagiri Hills, the Periyar flows towards the north and later turns to the northwest, to finally lose itself in the backwaters at Munamban in Ernakulam District. Floods caused by the Periyar in 1341 completely destroyed the once important Cranganore Harbour. As a result, the Kochi Harbour gradually took over and became an important port in its own right. During Tipu Sultan's incursion into Travancore through Aluva, the floods of 1789 forced him to retreat. River flows for 209km before merging into the sea, and is Kerala's second longest river. The river originates from the Anamalai Hills at an elevation of 1,964m. It gurgles from Coimbatore (Tamil Nadu) into Kerala, and slides down through Palakkad, Thrissur and Malappuram Districts to eventually slip into the sea, near the town of Ponnani. The Pambayar River, formerly known as Pampa River, is the third longest river of Kerala. After branching off into several channels, the Pambayar River finally joins the Vembanad Lake. The river runs a course of 176km and covers a basin of 2,223km. Large boats of over 60 feet in length covered with sheets made up of coconut leafs or palm leafs. Now these are converted into floating luxury dwelling units. These houseboats come in all shapes and sizes. 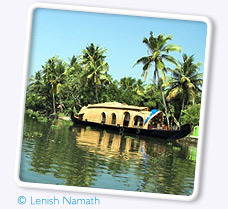 The houseboats are generally powered by a small outboard engine, allowing one to cruise along the the backwaters. Now lot of facilities are providing in houseboats like rooms, kitchen, dormitories, conference rooms, etc.